Touren mit Abenteuer - Elementen. Sie besuchen die Basiscamps, Höhenlager über 2500 m ü.M., Unterkünfte in Zelten, Jurten, Wanderungen in den Bergen bis zu 4 Stunden. Kirgistan ist ein bewundernswertes und einzigartiges Land. Diese kleine Oase mitten im Herzen des Zentralasiens beeindruckt durch die vielfältigen Naturlandschaften, und eine nicht unbedeutende Rolle in dem spielt der See Issyk Kul mit. Das reiche historische und kulturelle Erbe des kirgisischen Volkes ist genauso interessant. Alle Attribute der nomadischen Lebensform wurden sich bislang im Land bewahren. Eben hier im Sommer kann man Jurten beobachten, die nomadische transportable Behausungen, die bei den Filsteppichen dekoriert sind; Nomaden treffen, die werden sich freuen Sie zu begrüßen und können Sie in ihre Jurte einladen, um dem traditionalen kirgisischen Getränk Kumys zu schmecken. Ganz auf Wunsch haben Sie die Gelegenheit Pferde zu reiten und schmackhafte Nationalgerichte zu kosten! Arrival in Bishkek early in the morning. 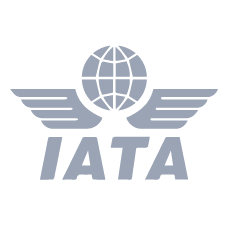 Upon arrival at the International Airport Manas you will be met by our tourist guide at arrival gates. Transfer to the city will take 30-40 min. Hotel check in (early check in is included into the tour cost). Heading back to Bishkek. Lunch at a local cafe. 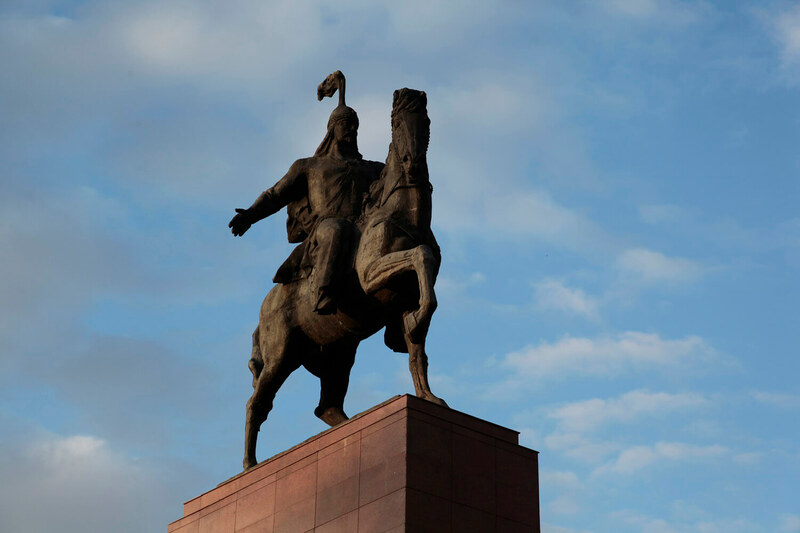 After lunch we head out on a sightseeing tour of Bishkek, which includes: the Monument of Kyrgyz National hero Manas, Changing of Guards of Honor, Kurmanjan Datka Monument. A sightseeing tour of Bishkek comes to an end at Victory Square. After excursion we will go to ZUM (Central department store) to buy souvenirs. 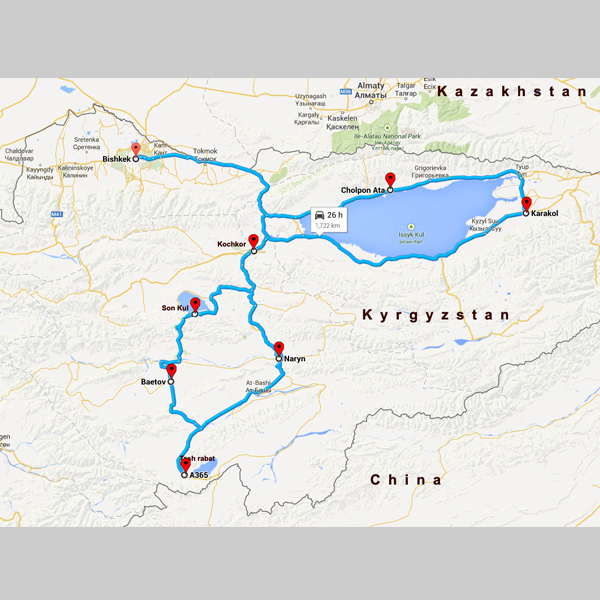 Today we will have a long drive to Son Kul Lake, so we leave early in the morning. The road to the lake lies through Boom gorge; Orto Tokoi Reservoir and dramatic Kalmak Ashuu pass (3445 m). Lunch at a local Kyrgyz family in Kochkor village. 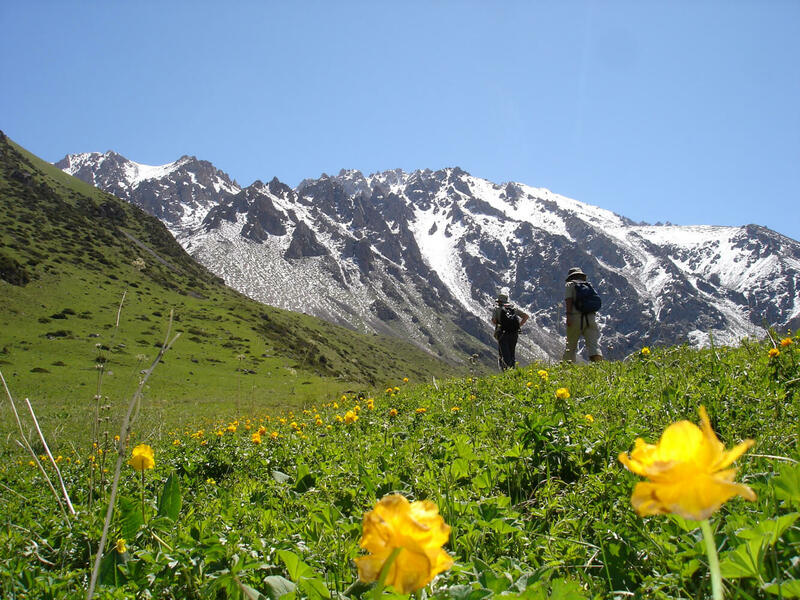 Alpine Son Kul Lake is located on Tien Shan range at the elevation of 3016 m. The territory around Son Kul is a pasture for the cattle driven from Kochkor village, Naryn and Jumgal regions. During the summer Son Kul pasture is considered to be the best Kyrgyz jailoo. The road to the lake goes through the windy mountain passes and vanishes in the sky. 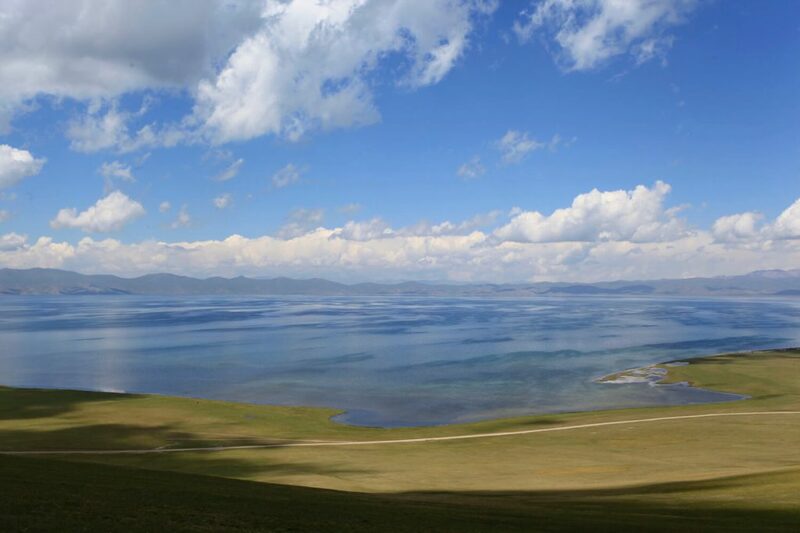 As a result Son Kul Lake t from Kyrgyz language ranslates as “Last Lake”. Arrival at Son Kul Yurt Camp. Accommodation in yurts 3-4 pax. Here you can feel like a real nomads and get acquainted with the culture of Kyrgyz people. Yurt – is a traditional dwelling of nomadic people of Central Asia. The foundation of yurt consists of wooden carcass and several felt layers. The construction of such dwelling doesn’t require a lot of time that makes it practical and useful for locals. The interior of a yurt is decorated with felt carpets and traditional embroidery. After breakfast departure from Son Kul Lake to Tash Rabat Caravanserai via Kalmak Ashuu pass (3665 m) that brings you to great scenery of Tien Shan Mountains and serpentine road. The road takes you down to Naryn town. You will make a stop for lunch in Naryn town. Naryn is a town of long and narrow form, situated along the famous Naryn River also named Syr Darya, which is one of the biggest rivers in Kyrgyzstan and Central Asia. Naryn is the only town in Kyrgyzstan, where 90 % of the population is Kyrgyz. Free time for a walk. The excursion to Tash Rabat Caravanserai can be accomplished in the morning next day, when a sun will light it up with the rays. Tash Rabat caravanserai is situated at the elevation of 3200 m asl. not far from Chinese border (Torugart). Its origin is a complete mystery; however there is a hypothesis that it was built in 10th century. Researchers consider it to be a Nestorian monastery, others suppose it to be a victualing-house for the trade caravans, and third ones insist on its defensive function. It is obviously clear that during the various epochs Tash Rabat caravanserai had different functions. Dinner and overnight at the yurt camp. Day 4. Tash Rabat Caravanserai – Naryn – Kochkor village. Lunch at a local café in Naryn town. 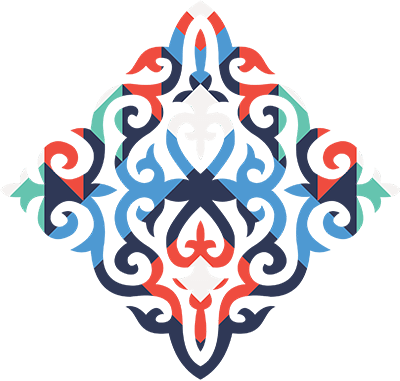 After lunch you will visit the Central Blue Mosque, the Central Square, and Historical-ethnographical museum. After excursion continue your way to Kochkor village. Dinner and overnight at a local family. Day 5. Kochkor village – Djety Oguz gorge – Karakol town. Breakfast at a local family. 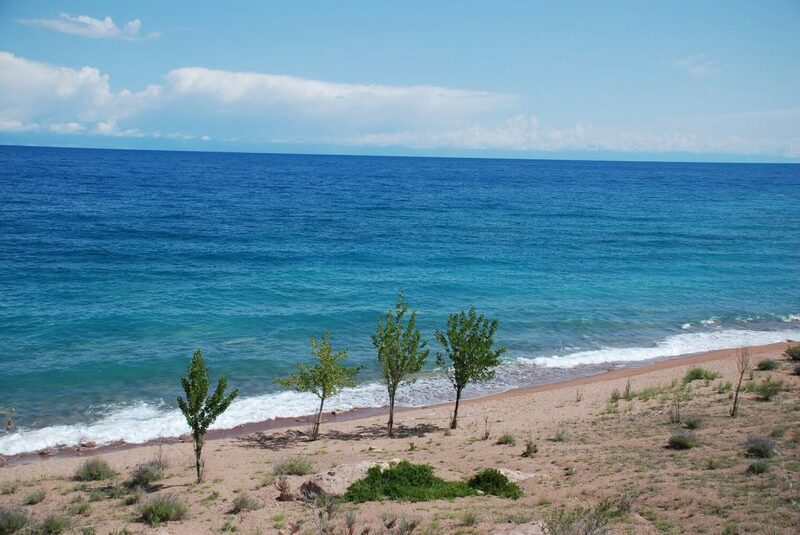 After the breakfast you head the southern shore of Issyk Kul Lake towards Karakol town. Karakol – is a small but very interesting town with traditional Russian architecture. It was established in the middle of 19th century and became an important garrison settlement in the territory of Issyk Kul region. On the way you admire beautiful landscape and changing of scenery. You will make a stop at one of the most beautiful places for a short walk. The place is Fairy Tale Canyon (Skazka). The canyon looks scenic with the dark blue Issyk Kul Lake on the background. After a walk we continue our way to Tamga village. After lunch you will head to Djety Oguz gorge. Djety Oguz from Kyrgyz language is translated as Seven Bulls. 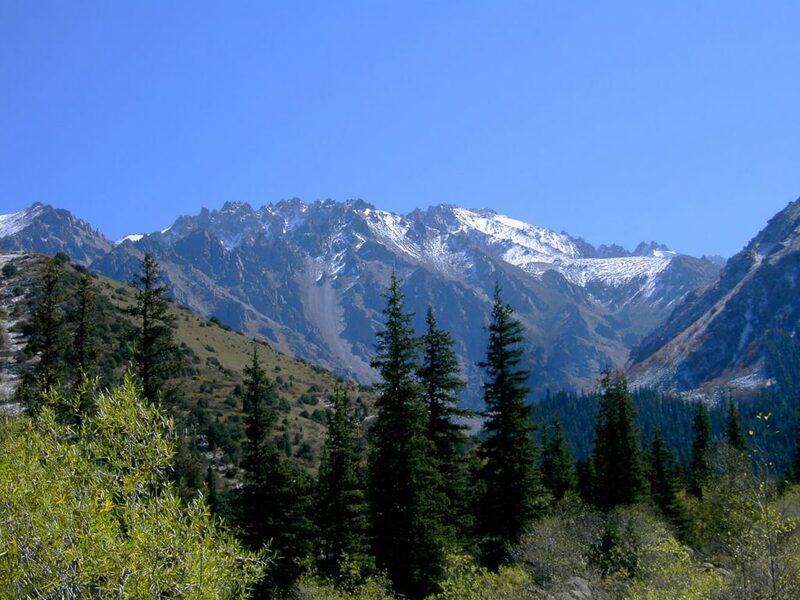 Unlike Fairy Tale Canyon this picturesque gorge differs in the mountains covered with Tien Shan fir tree. At the beginning of the gorge you will face a famous Broken Heart Rock. Walking up further to panorama you will see those famous Seven Bulls rocks. The tourist guide will tell you the legend about the origin of the gorge name. In Soviets, there was a sanatorium built in the gorge. Many people used to come here for treatment with the help of radon water. Cosmonauts used to come here for rehabilitation, even Yuri Gagarin. Dinner at a local Uighur/Dungan family. After breakfast you will visit Dungan mosque a unique building in a style of the Chinese pagoda which is functioning mosque up to now. 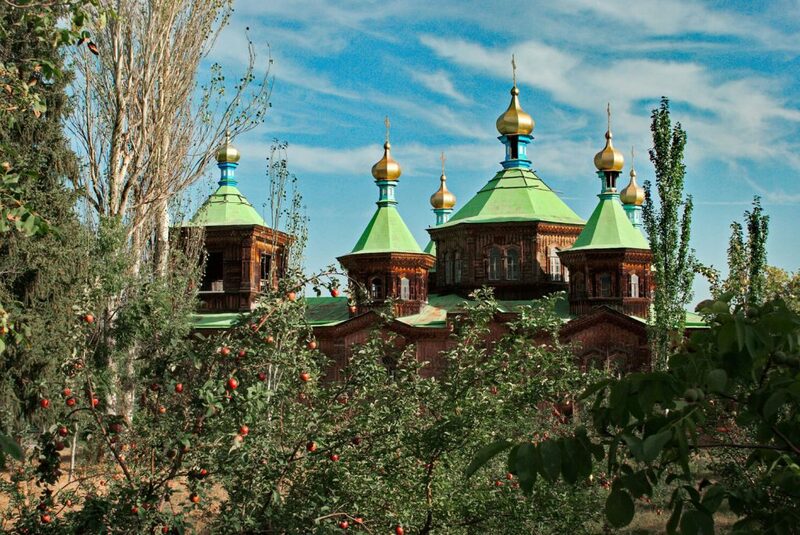 Also you will visit Russian Orthodox Holy Trinity Church built of wood without a single nail used. In the miraculous iconostasis of the church there is the famous Tikhvinian icon of Divine Mother, painted in 1897. After Karakol sightseeing you head to Memorial Museum of N.M.Przhevalsky a great Russian explorer and researcher of Asian continent, which 12 km far from Karakol. Drive to Cholpon Ata town. After lunch visit the Open air Petroglyphs Museum. Petroglyphs are dated back Sak-Usun period from 9-8 century up to 3-5 century AD. The territory where Petroglyphs are found lying below the Kungey Alatoo Mountains with a beautiful view of the lake. Burana Tower (ancient minaret) is located in 12 km far from Tokmok town. The territory where the tower is located was called Balasagyn town. 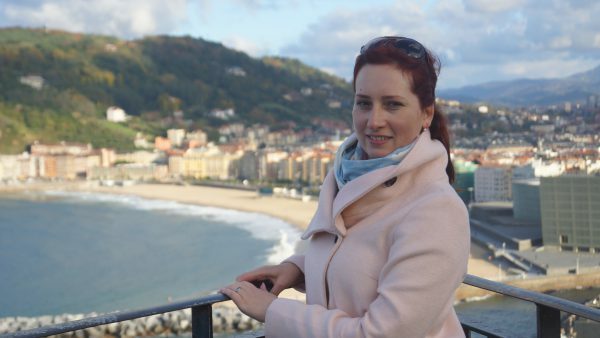 This town had the strategic meaning for Great Silk Road. Here you will see a small museum with exhibits found at excavations, providing more details about this ancient settlement, and become familiar with collection of Balbals, turkic grave marks. Lunch at a local Kazakh family in Tokmok. Arrival in Bishkek, check in. Farewell dinner and folklore show at a local restaurant. Especially for you musicians will play national melodies of Kyrgyz people and show you musical instruments. You will listen to a singing and enjoy the charming melodies of our ancestors. Today in Bishkek your trip concludes. 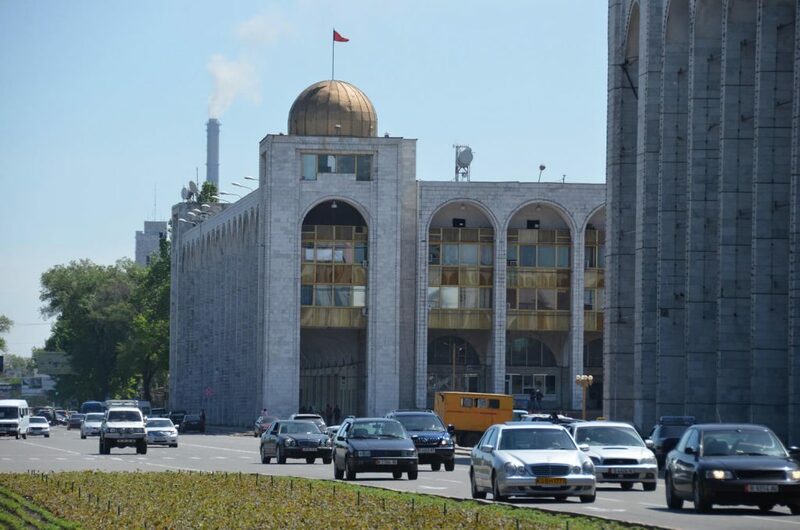 Take whatever you like but remember that our trip will start in Bishkek, where the temperature may go up to 45 C. By contrast, the horse-riding part is at the altitude of 3000 m., where the temperature can go below 10C in the night. Therefore, you should be prepared to all weather conditions. As to the dress-code remember that Kyrgyzstan is a “mild Muslim” country (so, please, no minis, guys))). 8. Good trekking boots for easy hikes in the mountains. 10. Personal first aid kit (most likely problems: blisters, sunburns, allergy, diarrhoea, sore muscles after hikes. Take painkillers, anti-histaminic, antibiotics of general action, and anything you need for your usual medical conditions). 11. Personal hygiene kit (disinfection gel is highly recommended) + some toilet paper. 13. A flask for water (at least 2 litres), which should be easily accessible when you hike. Though you get normal 0,5 bottles of water, in the mountains you may want something more solid. 15. Gloves (for sleeping at 3000m above sea level, if you are sensible to low temperatures or sun). 21. A smaller backpack, except for your normal suitcase. 23. You may want to have a small walking stick, if you are going on a hike – it is up to you. 24. Hygienic lipstick for the trekking part. 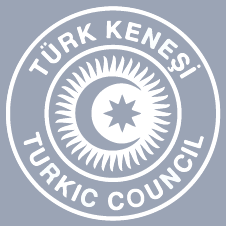 Экскурсионные туры, Reisen entlang der großen Seidenstraße.